There are plenty of rewards credit cards today. Many are downright impressive while others leave consumers wondering why they even bother. With the fee structures, the co-branding that’s often part of a rewards program and the confusion over expiration dates and transfers, it can quickly become overwhelming. 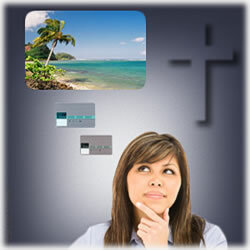 For quite some time, we’ve written about the credit card offers that have impressive rewards programs. Not only that, but if you haven’t looked lately, you’ll likely find yourself surprised at just how generous they’ve become. For instance, the Discover It card has absolutely transformed the way we see credit cards – and it’s still in its infancy, but it’s that strong of a credit card offer. With its rotating 5% cash back categories, a Cash Back Concierge, who serves as a source of information as you try to make the most of your rewards and the late payment forgiveness perk, it’s a solid choice that’s become the “must have” for those who appreciate great rewards. But what happens if you die? Let’s face it, there are those who religiously cultivate their rewards programs. They like knowing they can fly for free, enjoy nice discounts at the gas station or even use their rewards for things like merchandise and hotel stays. And on a side note: don’t underestimate a mother who’s neck deep in her credit card statements, calculator and laptop in the weeks before vacation. You wouldn’t believe how focused they are in making sure they put to use every single rewards point they’ve accumulated over the year. Trust us – we know from experience. There are a few reasons why your rewards can’t be transferred after death. This doesn’t mean it’s always so, but it does provide a bit of insight as to why it can be confusing and if you’re wondering, yes, it indeed goes back to the terms and conditions and yes, we’re going to continue to encourage consumers to always carefully review those terms and conditions before choosing any credit card offer. First up are those that are usually teamed with airlines. Even if the credit card company wanted to put into place a policy for its rewards that a deceased customer wishes to pass to an heir, there are all of those legalities with the airlines. It introduces a host of complications that would take ten lifetimes to work through. For instance, what happens if your weird cousin on your mom’s side was bequeathed your aunt’s travel rewards and then it’s discovered he’s been pegged in some government list as a high risk because of that joke he pulled last year on the flight from Houston to Boston? And remember how much pride he took in retelling the story and what he told aviation officials about their inability to take a joke? For airlines, they don’t want to risk those kinds of complications when it comes to points left to someone they don’t want on their airlines. And to be sure, these co-branded credit cards are being used in increasing numbers, too. People love bonus miles, such as what the Gold Delta SkyMiles card from American Express offers. All of those double miles on Delta purchases, first bag free bonuses, premium travel perks like Priority Boarding – all of those benefits coupled with no introductory rates? It’s little wonder it’s one of the most popular miles rewards cards on the market today. Clearly, it could become legally problematic when you start introducing wills that include those kinds of risky heirs. And then there’s the way the rewards are treated from a monetary value. Most have none, and therefore, no one can actually “own” them. Even if there’s no expiration dates, they’re not – at least in a legal sense – real property. Therefore, you can transfer something you don’t own. It gets tricky, though. For instance, American Airlines says it will “consider” transferring rewards provided there’s a legal document that’s been court approved. And often, those considerations are only given when there’s a divorce – and not a will – that’s involved. If it sounds like someone’s playing semantics, it always comes back to ensuring they’re not legally vulnerable. On the other hand, mileage points earned with United, known as the United MileagePlus program, are never transferable in any situation. There are also privacy laws to consider. One example provided is some rewards points programs will allow a transfer if, of course, it’s been requested in the will, only if the one who stands to benefit from them can actually access the deceased’s online account. That said, there are legalities associated with that scenario, too, namely the risk of fraud. Most credit card users like the idea of online access, so it stands to reason, they conduct all of their credit card business through the card network’s website. For instance, Capital One has always encouraged consumers to use its online resources. The Capital One Cash Rewards credit card makes it easy to see if you’ve met the criteria for the $100 cash back bonus. Because the stipulations are that $500 must be spent with in three months of opening the account, the card holder can check to see if he’s met that criteria and if not, how much more he needs to spend or how much time he has left to take advantage of it. Also, Capital One allows consumers to personalize their credit cards online by uploading their own images. It makes sense, then, that heirs would like to be able to access the online accounts. But again, there’s always the risk of the wrong family member guessing the necessary information to log in. That could certainly complicate matters, especially if he takes it upon himself to transfer his own balances to the deceased relative’s Capital One account. I ain’t leaving you nothin’. I’m spending all my rewards points. Don’t even ask! And that brings us to the bottom line: life’s short. Why not make the most of those rewards that are accumulating now? Put them to good use, take a trip, cash out your cash back and go shopping or fill your gas tank. There’s always the possibility, too, that you could even donate them to a charity. Check with your card company to see what its policy is on charitable donations. Remember, though, and especially if it’s mileage points, the airline will have its own policies, so be sure it and the credit card company are on the same page. Finally, there’s always the possibility that there are fees associated with any kind of transfer. In most instances, those fees hover around $100, so it may not even be a viable option if you don’t have a lot of points or miles accumulated. So how about it? Is this something you’ve ever even thought about? Have you already covered those bases and if so, what did you find out and how did you handle it? Let us know your experiences.